MSC Apex Modeler is a CAE specific direct modeling and meshing solution that streamlines CAD clean-up, simplification and meshing workflow. The solution features sophisticated and interactive tools that are easy to use and easy to learn. Direct Modeling - Direct modeling allows users to create and edit geometry interactively. Simply select the entities of interest, such as a face, edge or vertex, and push, pull, or drag to implement any modifications. Direct Modeling is complemented with built in meshing technology. Direct Modeling and Meshing - For models that have already been meshed and require further geometry modification, use any of the Direct Modeling or Geometry Clean-up/Repair tools and the mesh will be immediately regenerated. 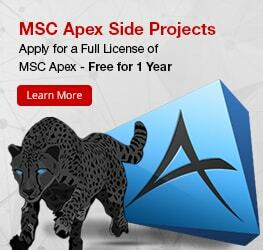 Easy to Use, Easy to Learn - MSC Apex was designed to have multi-purpose tools so as to make the application easy to use. It also features numerous learning aids such as tutorials, video based documentation, workflow and at-mouse instructions which promotes single day productivity. Specify feature type, such as chamfers, holes and cylinders. Then define feature dimension ranges, and automatically remove targeted features from the model. Automatically or manually perform midsurface extraction. Options include: auto offset, constant thickness, distance offset, and tapered midsurface. Select an edge or vertex and interactively drag it to a desired location. Guidelines provide a preview of the action being performed. Mesh models based on mesh size, element type, mesh seed and feature. Use direct modeling to further repair geometry that may already be meshed. Slivers or cracks may easily be resolved while the mesh is regenerated automatically. Use Auto Thickness and Offset to create numerous property definitions for shell elements, and export to .bdf format.